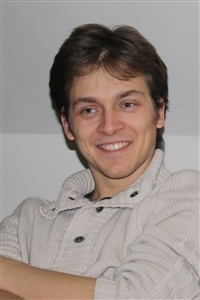 Antoine Van Vooren is a postdoctoral research fellow. He obtained his Master Thesis in 2005 (University of Mons), and did his PhD in science in the same university, in the laboratory for Chemistry of Novel Materials on charge transfer reactions. His research interests mostly deal with the opto-electronic properties of conjugated organic materials from a theoretical point of view. His domain of expertise is the theoretical characterization at quantum chemistry and molecular mechanics level. Impact of Bridging Units on the Dynamics of Charge Generation and Recombination in Organic Solar Cells. A. Van Vooren, V. Lemaur, A.J. Ye, D. Beljonne, and J. Cornil. Electronic Structure and Charge-Transport Properties of Polythiophene Chains Containing Thienothiophene Units: A Joint Experimental and Theoretical Study. B.M. Milian, A. Van Vooren, P. Brocorens, J. Gierschner, M. Shkunov, I. McCulloch, R. Lazzaroni, and J. Cornil. .Intrachain versus Interchain Electron Transport in Poly(fluorene-alt-benzothiadiazole). A. Van Vooren, J.S. Kim, and J. Cornil. Solid-State Supramolecular Organization of Polythiophene Chains Containing Thienothiophene Units. P. Brocorens, A. Van Vooren, M. Chabinyc, M. Toney, M. Shkunov, M. Heeney, I. McCulloch, J. Cornil, and R. Lazzaroni. Charge-Transfer Character of Excitons in Poly[2,7-(9,9-di-n-octylfluorene)((1-x))-co-4,7-(2,1,3-benzothiadiazole)((x))]. J.M. Winfield, A. Van Vooren, M.J. Park, D.H. Hwang, J. Cornil, J.S. Kim, and R.H. Friend. Journal of Chemical Physics 131 (2009) 035104.